The soccer striker is the goal-scorer on a soccer team, and the player who plays the closest to the opposition goal during a game. Soccer striker training should incorporate shooting technique, movement and decision-making. A soccer striker must have the ability to keep possession of the ball for his team during open play, and to shoot and score goals when the opportunity arises. Shooting technique is a vital aspect of soccer training for a goal-scorer. When shooting toward the opposition goal, a soccer striker must plant her foot directly next to the ball with the toes pointing toward the target. The ball should be contacted with the knee over the ball and the follow-through should point at the target. Practice technique by incorporating plenty of repetitions. Have a player feed you 20 to 30 balls inside the 18-yard area and practice taking a touch and shooting on goal. Perform this drill from outside the left goal post, central to the goal and outside the right goal post. A good distance to practice shooting on goal is 10 to 15 yards away. Whether you are shooting for power or accuracy will determine which surface of the foot you use to shoot the ball. When shooting for power, the toes should be pointing down and the laces of the foot used to powerfully propel the ball toward the opposition goal. When shooting for accuracy, use the side of your foot to contact the ball, with the follow-through pointing to the target. Have a player roll a ball to you and call as it arrives "power" or "accuracy." This will teach you to make decisions quickly. Practice plenty of repetitions of both. A soccer striker must be able to lose defenders in short spaces to open up an opportunity to score a goal. Forwards should practice creating space by playing one-on-one, or two-on-one attacking drills. Use the 18-yard area as the boundaries and practice running to near post or far post, as well as checking back to ball to lose a defender. Shooting drills that involve plenty of repetitions ending in a shot on goal should be used regularly as part of a soccer training regime for a striker. 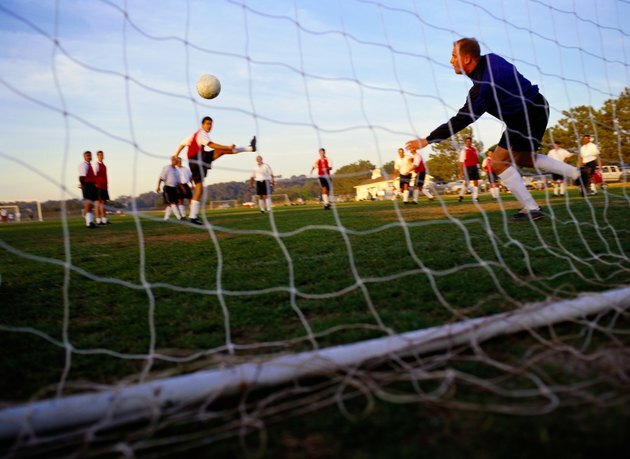 Examples of drills a soccer striker can use include balls being rolled from the side of the penalty box with the striker taking a touch and releasing a shot on goal. Adding defensive pressure is a big help to soccer training for a striker. Defensive pressure allows you to develop a feel for when to shoot early or when to take your first touch away from the defender.